Equitable House, Woolwich, is best appreciated with your back to the Tesco building. 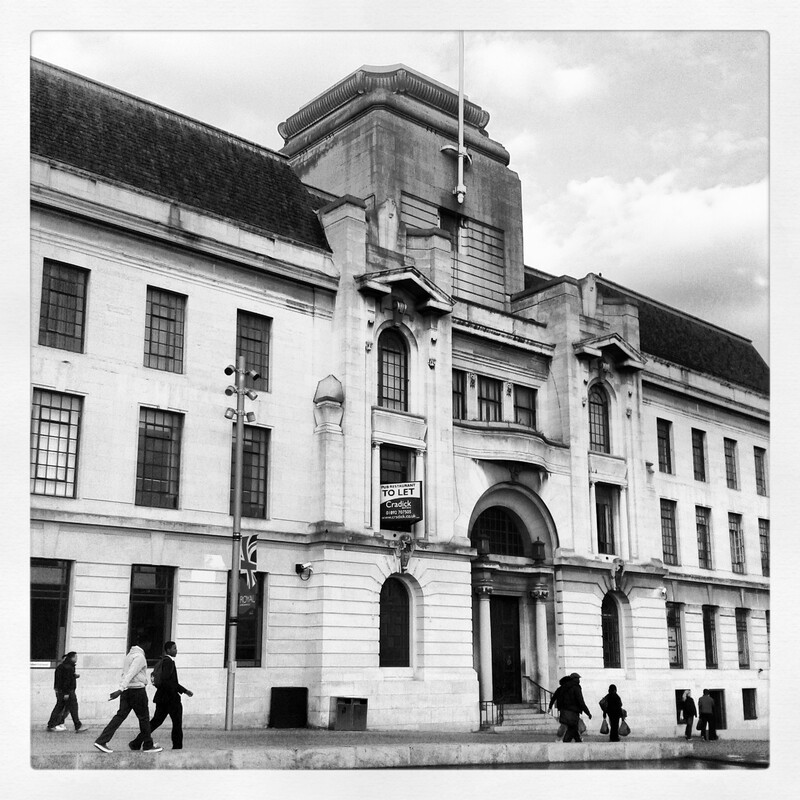 Built in 1935, Equitable House brought a healthy dose of Art Deco and Neoclassical elegance to Woolwich. Until Tesco landed like a piece of space junk late last year, the former headquarters of the Woolwich Equitable Building Society dominated General Gordon Square. If you stand facing away from Tesco, you can pretend that Lionel Upperton Grace’s design still does. The building society moved out some years ago and since then Equitable House has endured some indignities. A handful of businesses have snuggled into its periphery–two of those, sadly, are betting shops–but large tracts of its cavernous interior remain unused and hidden from the public gaze. 2013 may be a turning point, however. An independent coffee shop has just set up in the left-hand corner (as you face the building) and deserves to thrive. Sometime this year, Antic Pubs plans to set up in the centre of the building. The denizens of Woolwich are thirsty with anticipation. Yesterday, I was lucky enough to get a butcher’s inside the building’s main banking chamber. It is a jaw-dropping space. Boasting beautiful, classical proportions, it feels grand without coming across as dour or forbidding. Even on a dull day, a soft natural light washes down from a large and intricately detailed skylight. In short, it’s a revelation. Some features have been removed or tampered with but there’s enough original character to present an opportunity for an inspired renaissance. I managed to take the following snaps, which I hope will whet your appetite. The building opposite, with the teletubby humps outside should be in the running for the Carbuncle Cup. I remember going into the old Equit, to pay-in money, when the banking hall was indeed a banking hall. At that time the sleek lines of the well designed and executed hall were added to with the addition of lovely 80’s fluorescent light strips. It was designed to be a calm and pleasant place, and my memory is of just that – despite the queues! It’s great that one of Woolwich’s more imposing buildings is finally getting another lease of life. Where the two bookies are now, was used by National Westminster Bank for some time (and you can still see the remains of the sign burned onto the wall) and more recently estate agents (originally Woolwich Estate Agents). Wow that was odd. I just wrote an extremely long comment but after I clicked submit my comment didn’t appear. Grrrr… well I’m not writing all that over again.